i’m curious what other 10 (or so) would end up on your favorites list. Oh, I didn’t realize “Feed” WAS on audio. I might have to hunt that one down. I tried reading it, but I think it might be a much stronger experience on audio. There are at least 2 books called “Feed.” One is by M.T. Anderson or something and is YA. I actually tried to listen to that one and didn’t like it and abandoned it, even though it supposedly has won awards. Too much use of outside sound effects for me. This one is by Mira Grant and is this post-apocalyptic story about new v. old media, politics, culture, and it is fascinating. It would be difficult to choose a favorite narrator, but for me Steven Weber would be right up there. No contest for me on the favorite narrator (ha! big shocker!). I keep adding audio to my line up but it’s mostly a stab in the dark for what I’ll read. I’m hooked right now on playaways and my library only has 200 titles to choose from. I haven’t tried playaways but my library has a few (not nearly 200, I don’t think), so maybe I should check them out. Still relatively new to audiobooks but so far I’ve been lucky to enjoy some great books! LOL, I take the long way home to keep listening! Published this meme on my blog. I’m surprised i’m the first one to mention my favorite narrator Davina Porter she does the Outlander series and makes it come alive! You’re the first one to mention it here but, like Jen Forbus said, I’ve been seeing her name on other people’s memes. I think you can be forgiven not participating when you’re in the middle of a move! Glad you’ve been able to enjoy some audiobooks while you’re doing it, though. Anything special you’re listening to? Susie, you’re in good company! Beth Fish Reads also commented on Davina Porter today at her site. THE HELP was wonderful on audio. there’s always something a bit special about a cast of narrators. 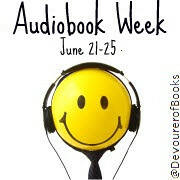 I’ll be talking tomorrow about some of my favorite narrators, so I’ll save that for then. Wow! Some of those questions were tough! I love doing this, this has been really fun–especially to see what everyone else is saying about audiobooks. The writing and narration take you to the time and place immediately and effectively. This is an insane, intense, hard-core war story that puts the reader/listener in a Bravo Marine’s boots. This is not just for war vets though; it’s for everyone. I’m not done yet, but it’s already heading toward my pantheon of all-time great books/audiobooks. Not counting the Disney records with booklets that I listened to as a kid, I’ve been listening to audiobooks for the past 15 years. The first audiobook (again not counting the records and books when I was little) was Umberto Eco’s FOUCAULT’S PENDULUM (unabridged; narrated by Grover Gardner.) I was asked to proof it. How do you choose what to listen to versus read? It depends on which gets put in my path first, the hard copy or the audiobook; but if I don’t like the narrator or production quality of the audiobook, I’ll quickly drop it and pick the it up in print instead. I’m just finishing up Abraham Lincoln Vampire Slayer in audio. I have enjoyed: Lord Foulgrin’s Letters by Randy Alcorn, Heart Shaped Box by Joe Hill, the Harry Potter series, the Narnia books, Stiff by Mary Roach, Travel with Charley and Of Mice and Men both read by Gary Sinise, the Shack, the Aurora County All-Stars read by Kate Jackson, can’t forget the Father John and Vickie Holden mystery series, and for fun can’t beat Hank the Cowdog. sorry, got carried away. so much fun seeing what everyone likes.